RP: As you said, Gates-funded research publications must now have a CC BY licence attached. They must also be made OA immediately. Does this imply that the Gates foundation sees no role for green OA? If it does see a role for green OA what is that role? AF: I wouldn’t say that the foundation doesn’t see value or a role for green open access. However, the policy requires immediate access, reuse and copyright arrangements that green open access does not necessarily provide. The (excellent) Gates policy requires immediate access, reuse and copyright arrangements that gold open access does not necessarily provide, either. It provides them only because the Gates Foundation has quite rightly twisted publishers’ arms, and said you can only have our APCs if you meet our requirements. And if green open access doesn’t provide immediate access and reuse, then that is because funders have not twisted publishers’ arms to allow this. It’s perfectly possible to have a Green OA repository in which all the deposited papers are available immediately and licenced using CC By. It’s perfectly possible for a funder, university or other body to have a green OA policy that mandates this. But it’s true that no-one seems to have a green OA policy that does this. Step 1: Include the Share-Alike provision in your Creative Commons license, as in the mysteriously popular CC BY-SA and CC BY-NC-SA. Step 2: Listen to the crickets. You’re done. Congratulations! No-one will ever use your silhouette in a scientific paper, and they probably won’t use your stuff in talks or posters either. Luxuriate in your obscurity and wasted effort. Pachyrhinosaurus canadensis by Andrew A. Farke, CC BY 3.0, courtesy of PhyloPic.org. PhyloPic is the incredibly useful thing that Mike Keesey made where makers upload silhouettes of organisms and then people can use them in papers, posters, talks, on t-shirts, bumper stickers, and so on. Why are these things dumb? Well, you could make a case for NC, but it will still probably kill most potential uses of your images. Most journals are run by companies — well, most are run by incredibly rapacious corporations that extract insane profits from the collective suckerhood that is academia — and using such an image in a for-profit journal would break the Non-Commercial clause. Even open-access journals are a bit murky. But Share-Alike is way, way worse. What it means is that any derivative works that use material released under CC-BY-SA have to be released under that license as well. Share-Alike came to us from the world of software, where it actually has some important uses, which Mike will expand upon in the next post. But when it comes to PhyloPic or pretty much any other quasi-academic arena, including the Share-Alike provision is misguided. As of this writing, PhyloPic has two silhouettes of Panphagia. I can actually show you this one, because it doesn’t have the Share-Alike license attached. The other one is inaccessible. Image by Ricardo N. Martinez and Oscar A. Alcober, CC BY 3.0, courtesy of PhyloPic.org. People can’t use the images in barrier-based journals, because they’re copyrighted. People can’t use the images in almost all OA journals, because they’re CC BY, and authors can’t just impose a more restrictive license on them willy-nilly. People can’t use the images in their talks or posters, unless they want to make their talks and posters CC BY-SA. Even people who do release their talks and posters out into the wild are probably going to use CC BY if they use anything; they care about being cited, not about forcing downstream users to adopt a pointlessly restrictive license. People probably can’t use the images on t-shirts or bumper stickers; at least, I have a hard time imagining how a physical object could meet the terms of CC BY-SA, unless it’s being given away for free. And even if one could, most downstream creators probably won’t want the headache — they’ll grab a similar image released under a less restrictive license and move on. I can’t even blog the CC BY-SA images because everything we put on this blog is CC BY (except where noted by a handful of more restrictive museum image use policies), and it would more than a little ironic to make this one post CC BY-SA, which it would have to be if it included CC BY-SA images. You may think I’m exaggerating the problem. I’m not. If you look at the Aquilops paper (Farke et al. 2014), you’ll see a lot of ceratopsian silhouettes drawn by Andy Farke. We were making progress on the paper and when it came time to finish the illustrations, most of the silhouettes we needed had the Share-Alike provision, which made them useless to us. So Andy drew his own. And while he was doing that, I took some of my old sauropod drawings and converted them to silhouettes and uploaded them. Both of us used CC BY, because all we care about is getting cited. And now people are using — and citing! — Andy’s and my drawings in preference to others, some arguably better (at least for the sauropods), that have pointlessly restrictive licenses. So we have this ridiculous situation where a ton of great images on PhyloPic are essentially unusable, because people put them up under a license that sounds cool but actually either outright blocks or at least has a chilling effect on almost any conceivable use. Is this a good silhouette of Camarasaurus? Maybe, maybe not. But that’s beside the point: this is currently the only silhouette of Camarasaurus on PhyloPic that you can actually use. By Mathew Wedel, CC BY 3.0, courtesy of PhyloPic.org. Here’s my take: I care about one thing and one thing only, which is credit. 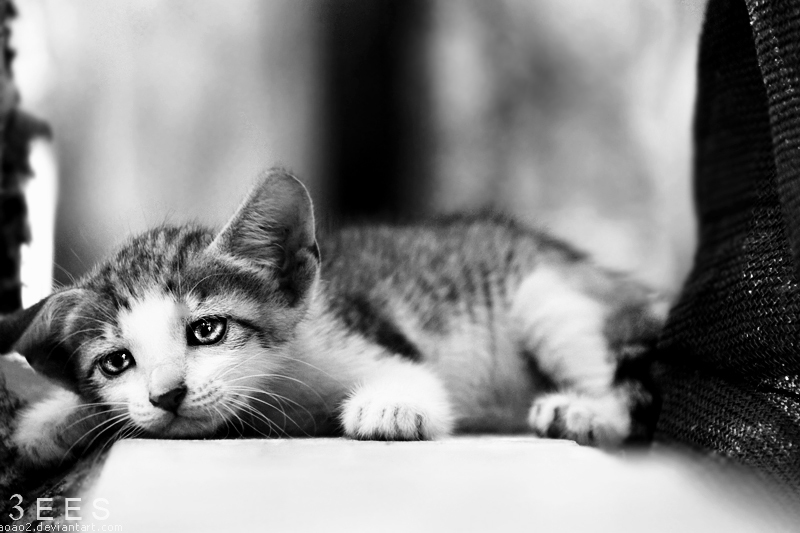 All I need is CC BY. If someone wants to take my stuff and put it in a product and charge a profit, I say go for it — because legally every copy of that product has to have my name on it somewhere, credited as the creator of the image. I may not be making any money off that product, but I’m at least getting exposure. If I go CC BY-NC, then I also don’t get any money, and now I don’t even get that exposure. Why would I hack my own foot off like that? And I don’t use CC BY-SA because I don’t write software, so it has only downsides to offer me. Now, there are certainly artists in the world with sufficient talent to sell t-shirts and prints. But even for them I’m skeptical that CC BY-NC has much to offer for their PhyloPic silhouettes. I know we’re all nuts around here for monochrome filled outlines of dead animals, but let’s be real, they’re a niche market at best for clothing and lifestyle goods. Personally I’d rather get the citations than prevent someone in Birmingham or Bangkok from selling cladogram t-shirts with tiny copies of my drawings, and I think that would still be true even if I was a professional artist. I suspect that a lot of people reading this post are dinosaur enthusiasts. If you are, and you’d like to get your name into published scientific work (whether you pursue writing and publishing yourself or not), get drawin’, and upload those babies using CC-BY. Make sure it is your own original work, not just a skin thrown over someone else’s skeletal recon, and don’t spam PhyloPic with garbage. But if you can execute a technical drawing of a critter, there’s a good chance it will be used and cited. Not only because there are still holes in PhyloPic’s coverage, but because so many otherwise great images on PhyloPic are locked up behind restrictive licenses. To pick an example nearly at random, PhyloPic has two silhouettes of Pentaceratops, and both of them are useless because of the Share-Alike provision in their licenses. You have an opportunity here. Don’t tarry. If you already uploaded stuff to PhyloPic using CC BY-SA for whatever reason (it sounded cool, Joe Chill murdered your folks, you didn’t realize that it was academic reuse equivalent of radioactive syphilis), change it or replace it. Because all it is doing right now is driving PhyloPic users to other people’s work. Really, honestly, all you are doing is wasting your time by uploading this stuff, and wasting the time of PhyloPic users who have to hover over your pictures to find out that they’re inaccessible. You don’t get any credit if no-one ever uses your stuff. Or, more precisely, you get 100% of a pie that doesn’t exist. That’s dumb. Stop doing it. For a long while, there has been a lot of anger among researchers and academic librarians towards the legacy publishers: the big corporations that control access to most of the world’s scholarly output. But what exactly is the problem? Let’s briefly consider several possibilities, and see if we can figure out which ones really matter. Is it the publishers’ profit margins? As we’ve discussed before, the Big Four publishers all make profits in the region of 35% of revenue, which is more than Google (25%) or Apple (29%) make. Essentially every time you buy something from Elsevier, a third of the money goes straight into shareholders’ pockets. But as I have previously argued, I don’t think this, in isolation, is a big problem. A company that could make a car for $500, if it sold that car for $1000, would be making a 50% profit: but that wouldn’t matter, because what we actually care about is the price we pay, not whether the price goes on costs or profits. So is the problem with legacy publishers the sheer cost of their products (whether made up of profit or internal costs)? This is definitely an issue, and has been for a long time: the serials crisis goes back several decades. It certainly seems to be true that publishers are collecting exploitative rent on research outputs that they own, hiking up prices much faster than inflation and using underhand tactics to force renegotiation in their favour. This is underhand and destructive — but not the core of the issue. Perhaps we get closer to the heart when we consider the provision of free labour by the authors, peer-reviewers and editors who donate their time, effort and professional expertise to enrich the publishers. No-one disputes that publishers add some value to the published work; but clearly 90% of the value is in the author’s submission, and 90% of the remainder in the volunteer-run editorial process. It sticks in the craw that the only people who benefit financially from all this are the ones who contribute least. But maybe even more fundamental than this is the problem that legacy publishers own and control the scholarly literature. That is the foundational truth that underlies all the other bad things I’ve listed here. 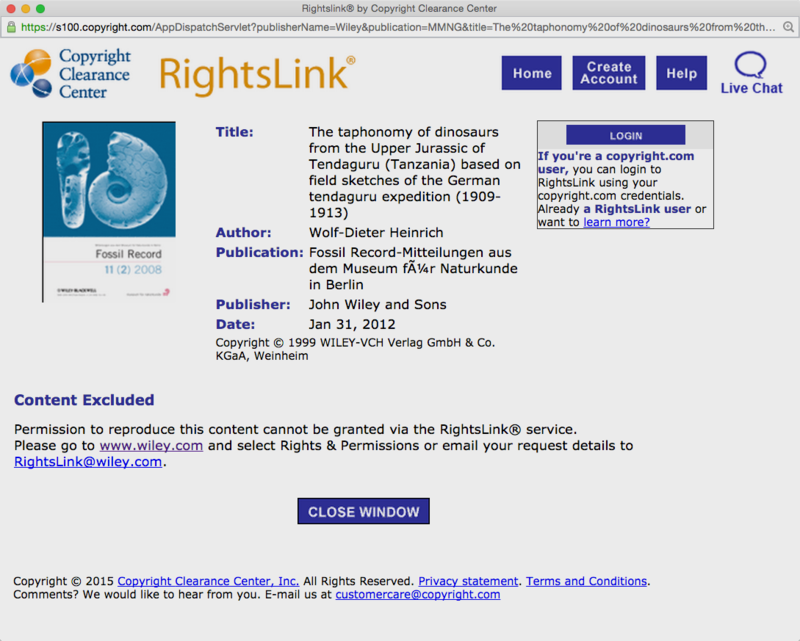 They own the copyright because researchers give it to them. And so can we honestly be surprised when corporations, given a resource, then exploit it for financial gain? The solution in the end is very, very simple: we have to stop giving them our good stuff. Just don’t. Don’t give your work to subscription-based journals. Don’t review for them. And don’t act as an editor for them. Scholarship belongs to the world, not to publishers who do the opposite of publishing. Publish your work where it benefits the world. Just launched: a new open-access journal of vertebrate paleontology, brought to you by the University of Alberta, Canada! It’s called VAMP (Vertebrate Anatomy Morphology Palaeontology), and it charges no APC. Here’s a illustration from one of the two articles in its first issue. Holmes (2014:fig 12A). 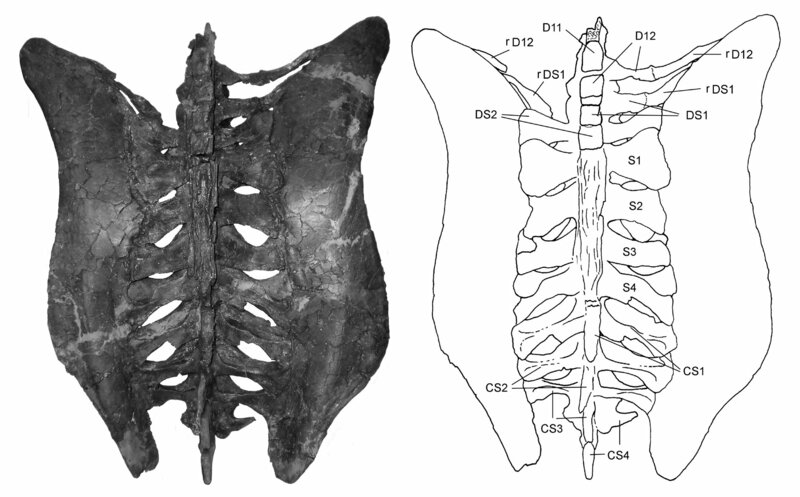 Synsacrum and pelvis of Chasmosaurus belli (ROM 843) in dorsal view. VAMP uses the canonical open-access licence, Creative Commons Attribution 4.0 International (CC By), which means it fulfils both the letter and the spirit of the Budapest Open Access Initiative’s definition of OA. It’s great that we in vertebrate palaeontology can add this journal to the roster of OA journals in our field, already including Palaeontologia Electronica, Acta Palaeontologica Polonica, Palarch’s Journal of Vertebrate Paleontology, The Fossil Record and others. 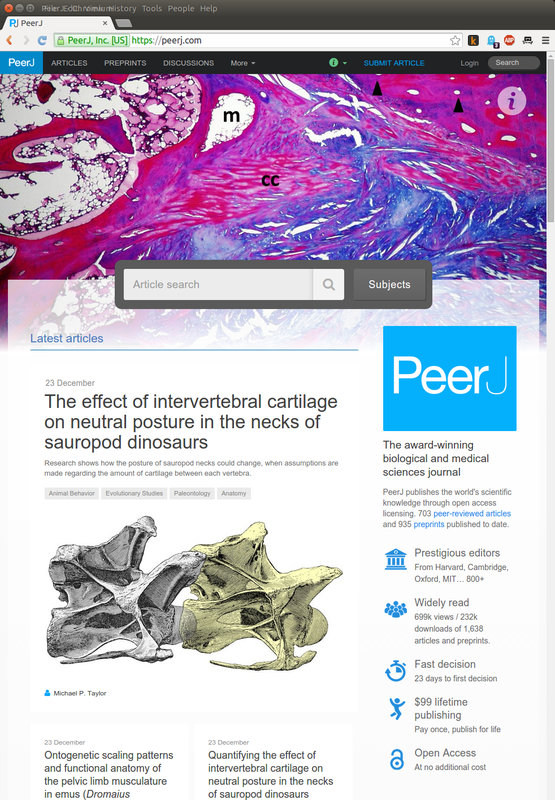 (Plus of course there is lots of vertebrate palaeontology in PLOS ONE and PeerJ.) I think that as a field, we are ahead of the curve in making the transition towards an all-OA literature. 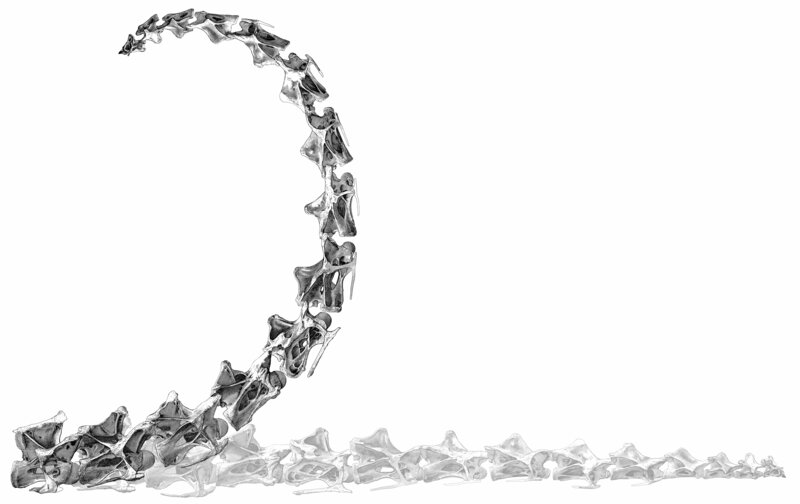 My neck-cartilage angle paper is out! Arriving as an early Christmas present, and coming in just a week before the end of what would otherwise have been a barren 2014, my paper Quantifying the effect of intervertebral cartilage on neutral posture in the necks of sauropod dinosaurs is out! You can read it on PeerJ (or download the PDF). 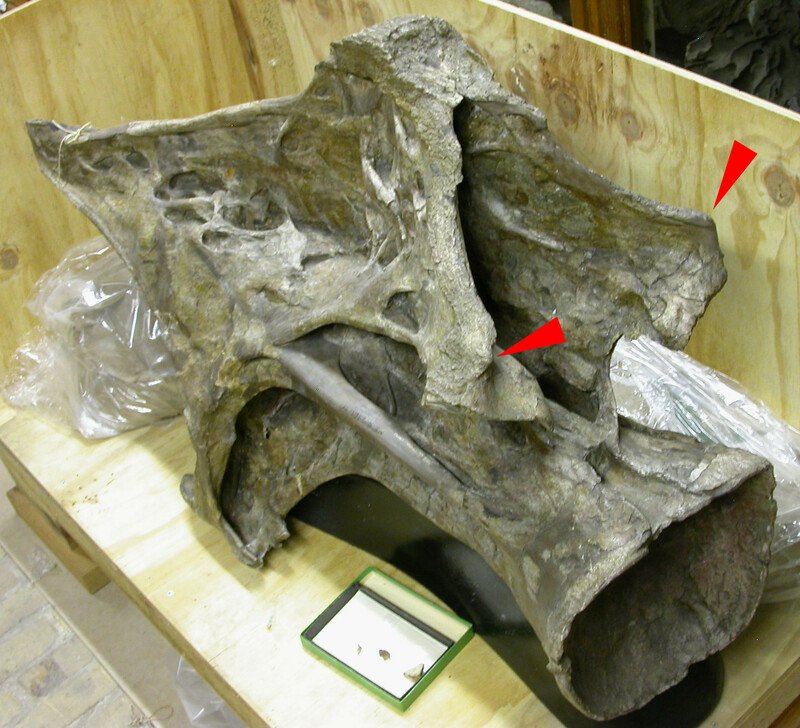 Figure 4: Effect of adding cartilage to the neutral pose of the neck of Diplodocus carnegii CM 84. Images of vertebra from Hatcher (1901:plate III). 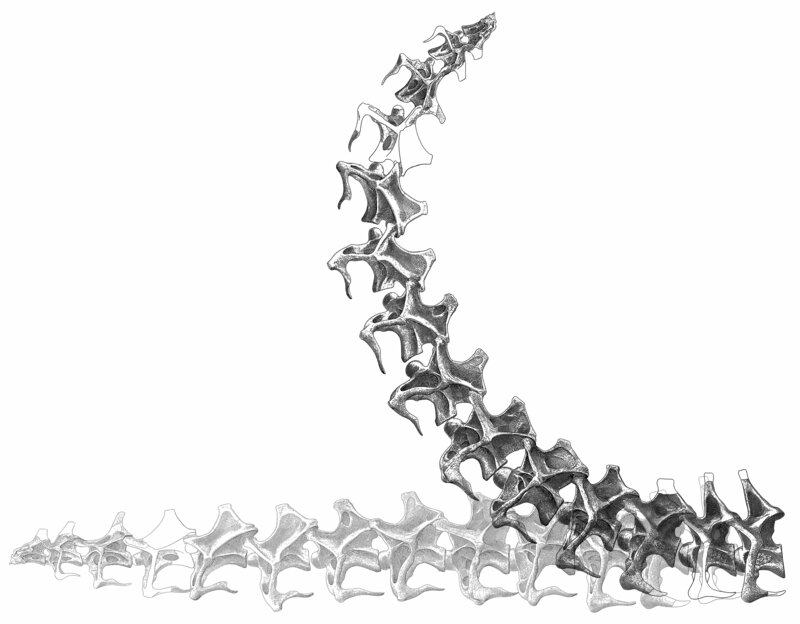 At the bottom, the vertebrae are composed in a horizontal posture. 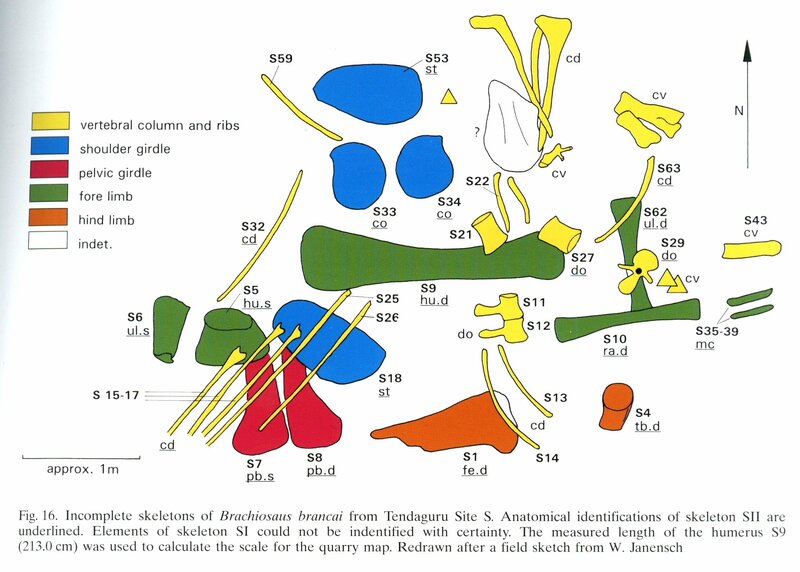 Superimposed, the same vertebrae are shown inclined by the additional extension angles indicated in Table 2. Which of course is how it ought to be! Great work here from handling editor Chris Noto and all three reviewers: Matt Bonnan, Heinrich Mallison and Eric Snively. They all elected not to be anonymous, and all gave really useful feedback — as you can see for yourself in the published peer-review history. When editors and reviewers do a job this good, they deserve credit, and it’s great that PeerJ’s (optional) open review lets the world see what they contributed. Note that you can cite, or link to, individual reviews. The reviews themselves are now first-class objects, as they should be. At the time of writing, my paper is top of the PeerJ home-page — presumably just because it’s the most recent published paper, but it’s a nice feeling anyway! A little further down the front-page there’s some great stuff about limb function in ratites — a whole slew of papers. Well, I’m off to relax over Christmas. Have a good one, y’all!